Continuing on from issue five, the Enterprise is still in orbit around Deneva where the population has been plagued by a form of giant parasite. Last issue Spock was attacked and now lies in sickbay with his face encased in an ugly alien mass. Certainly the comic book medium allows for a far creepier representation of the alien parasites than the original 1967 television show versions (that looked a little like latex fried eggs) and here they seem to have taken on an Alien-inspired aspect. The panel where McCoy attempts to surgically remove the parasite from the unconscious Spock’s face evokes similar attempts to remove the alien from Kane in Alien and is equally unnerving. Like Kane, Spock is eventually freed from the alien but his ordeal is far from over as his nervous system is compromised by the body-snatching creature. This issue continues to play on the subtle differences between characters in the original series and those of the 2009 film. Kirk’s relationship with his older brother is clearly informed by the way that his childhood played out following the death of his father at the hands of Nero. This new dysfunctional aspect of Kirk’s life brings a totally different energy to the story that is both refreshing and promises more to come in future issues. 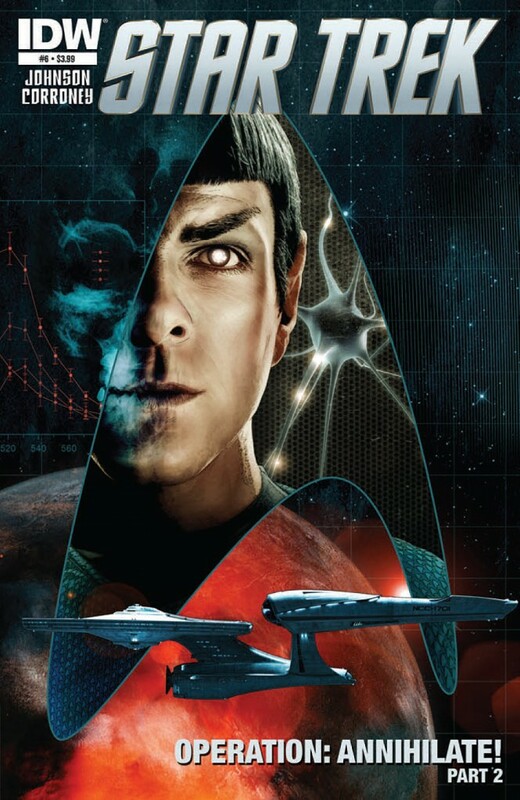 As always we are given the chance to compare and contrast the two depictions of Spock. His relationship with Uhura continues to feel a little bit forced at times although it does provide a handy avenue for the writers to show Spock with his guard down. Well, as down as Spock’s guard ever gets anyway which is more in the post-2009 version than the original.